Two late Try’s secured a bonus point win for Bedwas against a Neath side that fought hard throughout 36 - 28. On a sunny late February afternoon after a cagey opening Neath opened the scoring with a long range Penalty from fly half Jordan Rees after Bedwas were penalized at a ruck. Joseph Scrivens equalized with a penalty of his own four minutes later to level the score. A further four minutes later Bedwas captain Alun Rees was stopped just short of the line before Luke Crane darted over for a Try, improved upon by Scrivens. To compound Neath’s misery the referee brandished a yellow card to see them short of a man. Jordan Rees slotted another Penalty from long range after Bedwas were penalized for holding on in the tackle but Bedwas swiftly hit back with a Try from Dale Rogers, again converted by Scrivens. 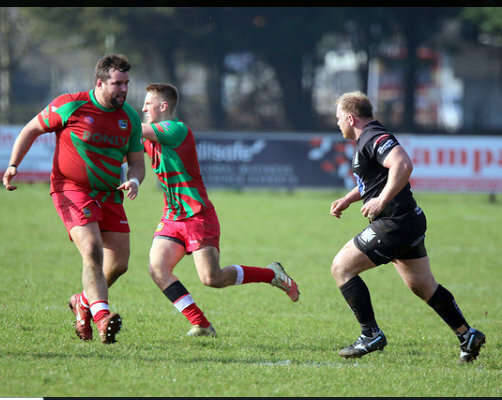 Neath lost a second man to the sin bin and Bedwas capitalized in the best possible way as Adam Williams making his 100th appearance for the club sprinted through down the left wing. Scrivens’ Conversion putting Bedwas further ahead. With the last move of the half Neath pulled a Try back from former Bedwas scrum half Nicky Griffiths, Rees’ penalty closing the gap to nine points. A second Neath Try by center Kieran Williams early in the second half went unconverted but a penalty by Jordan Rees after 51 minutes reduced the deficit to three points. Bedwas made a host of changes as Neath threatened to get back into the game but once the new legs were up to speed a break by Scrivens saw him score out on the right wing to earn Bedwas a four Try bonus point. The conversion attempt from the same player drifted wide but still Neath posed a threat. Four minutes after replacing Nathan Hudd Sion Parry crossed for his first Try in Bedwas colors, Scrivens added the extras to increase the home side’s lead to fifteen points. Neath regrouped and put Bedwas on the back foot and Adam Williams was dispatched to the sin bin for deliberate offside. With three minutes to play Neath sensed an opportunity and got their reward with a Try by winger Gareth Hopkins, replacement Callum Hall added the extras to reduce the arrears to eight points. The Bedwas defense held out to the relief of the home faithful, the bonus point taking Bedwas to 11th in the table and safe from the trapdoor of relegation but no-one will be taking anything for granted with a few crunch games to come before the end of the season.